back of a binder application unit. 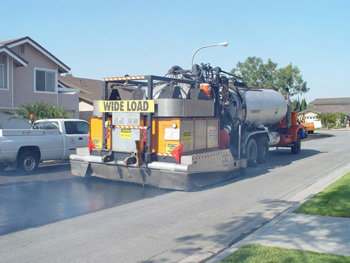 The two most prominent specification publications utilized by public works agencies, the Standard Specifications for Public Works Construction (the "Greenbook") and Caltrans Standard Specifications, set forth Asphalt-Rubber binder application temperatures between 375°F to 425°F. At these elevated temperature application ranges, violations of air quality laws would occur without effective emission control equipment. In order to have compliant ARAM applications, a certified and permitted emissions control device must be used to minimize visible emissions. All experienced ARAM contractors should have emissions control devices to ensure compliance with all relevant air quality laws, rules, and regulations.